Mount Washington. Tons of snow. Ultra Skiing. Mount Washington is a beautiful ski resort located only a two hour drive north of Nanaimo on Vancouver Island. To get there from Vancouver you have a few choices. Rent a vehicle. Drive to Courtney. Take a bus to Courtney. Via bus or passenger vehicle you take the Nanaimo Ferry from Vancouver and drive north. The full trip takes about 4 hours. 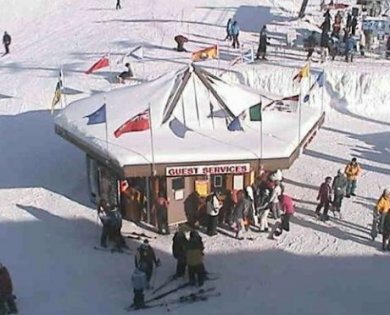 There is a bus service up to the ski resort from Courtney if you chose to travel by bus to the Island. You may fly by float plane to Comox or fly by air to the Comox airport. The float plane lands on water at the airports. The Comox Valley and Campbell River Airports have daily flights by Pacific Coastal Airlines and Air Canada. WestJet flies direct from Calgary and Edmonton to Comox and HeliJet offers a direct service from Seattle to Campbell River, and the Nanaimo ferry terminals are serviced from Horseshoe Bay and Tsawwassen on the Lower Mainland. Mount Washington visitors can arrange to stay in either the on-hill accommodations or in the nearby Comox Valley in either Comox or Courtney. Mount Washington has an annual attendance of over 400,000 guests, second to that of Whistler, and the village has a capacity to house 3,500 guests. Many Comox Valley hotels, motels, resorts and B & B's offer special ski packages. If you're not into driving, shuttle buses to the mountain run from a number of hotels in Courtenay. You'll find just about everything you need on the mountain including a restaurant, lounge, shops, equipment rentals, lessons and even a Kid's Zone. Most important of all, lots of snow. 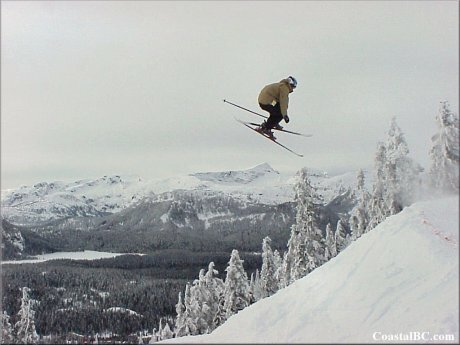 Mount Washington Ski Resort is located 20 miles (32 km) from Courtenay on Vancouver Island. With the new Inland Island Highway and paved Strathcona Parkway to Mt. Washington, traveling time from Victoria is only 3 hours. Please Note: Strathcona Parkway requires good winter tires OR that you carry chains with you. Be sure you have either one or you may be turned back if the highway conditions call for them. Night skiing is on from 4.30 to 9 pm Friday, Saturday and Holidays and all during the March break. Annual snowfall is 30 feet. The record is 1998-1999 when over 60 feet fell. 60 marked runs and acres of glades. Resort size is 1,200 acres. There are 2 high speed chairlifts, 1 six pack and one quad, 2 fixed grip quad, 1 triple chair, 1 double chair, 1 platter lift, 1 handle tow, and 1 tube lift, with a lift capacity of 12,200 riders per hour. The Mount Washington resort has 34 miles of cross-country ski trails, both track set and free style. Some of the trails are serviced by the Hawk chair. Trail hours are from 9am -4pm daily. The all natural snowboard park access is off the Whiskey Jack Chair and Eagle Express Quad. The very popular Ozone Snow Tubing Park is lift accessed, night lit, and has bonfires every evening. Cocoa Cabin. Located just a short walk past the Alpine Lodge - look for the Log Cabin. Monday to Friday: 1pm - 9pmWeekends, Christmas and March Breaks: 11am - 9pm 2 Terrain parks and a half pipe maintained with a pipe grinder. The All Natural Terrain Park & Half Pipe are maintained by a professional trail crew and open to everyone (skiers & snowboarders). Natural hits made from mother nature’s ingredients. Consists of volcanoes, table tops, 1/4 pipes and a 1/2 pipe. Expect variable alpine conditions. Halfpipe is accessed off the Whiskey Jack chair as well as The Eagle Express. Mount Washington Alpine Lodge features a sport and gift store, rentals area featuring top quality equipment, a secure locker area, groceries and a liquor store. Dining Facilities include the Alpine Cafeteria, Mountain Wok, Pie in the Ski Pizza, Fireweeds family dining, and Fat Teddy’s Pub. Fully licensed Childcare facilities. Snow-school both for adults and children. Mount Washington resort has a very wide variety of accommodations at your disposal. Plenty of private chalets as well as Condominiums.